It's been awhile since we've talked about nails, and I have quite a few more readers than I did in January, so I thought I'd let you in on the little secret that is my nail routine! Now, you and I both know that I don't have a lot of free time. But I've found that if I follow this routine, I can paint them at 8 pm, go to sleep at 10, and not have any sheet marks at all. Plus, my mani will last 4-5 days with no chips- I usually just have to repaint because of new growth. 1. 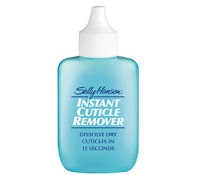 Sally Hanson Instant Cuticle Remover. I apply this all around my nails, wait a bit (you can wait longer that it says), then use the thumbnail of my opposite hand to push back/scrape the cuticles. I typically do this twice. 2. Wash your hands and dry them well. 3. Orly Bonder. This is fab- takes any oily residue off your nails and gives your polish something to stick to. Key to a long-lasting mani. 4. 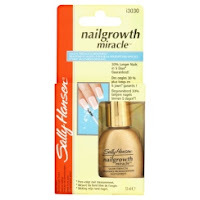 Sally Hanson Nailgrowth Miracle in the gold bottle. Love this basecoat. Watch for CVS to have their BOGO or BOGO half off on Sally products and stock up. 5. OPI polish (2 coats). In my non-professional opinion, the best polish there is. One of my faves is I'm Not Really a Waitress. 6. Seche Vite top coat. I won't use any other top coat. 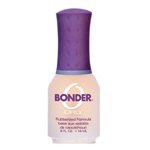 This is a super-fast dry topcoat with a fab shine. Expensive, but worth it! Now why don't you let me in on your nail or beauty secrets! 2. Clip when they start breaking. Actually I used to do my nails but somehow my finger and toenails developed a sensitivity to polish. It makes them separate and peel--very odd. So they stay a lot healthier if I don't use polish. Of course, that doesn't give me any excuse for no longer taking care of my cuticles but I'll just blame that on laziness. Sounds like a great routine and if my nails weren't nutty I might have to try some of those products! Ahhhhh, I was looking for this earlier! My fave color right now is OPI Hollywood and Wine - it's dark, but the undertones are brown, I think, so it doesn't look too Halloweenish with my pale skin! Oh I used to do my nails all the time, now I just keep the short, ha. If I were to push them back with a pencil eraser (like my mom used to do to me everyday) they would come back like you are saying. I adopted your nail routine after you posted it the first time. It works so well. Lasts much longer then when I go get a manicure done by a pro! If you've answered this somewhere else I apologize, but...where do you buy the Seche Vite topcoat? I'd love to try it! Thanks--love your blog! I'm No Cook, But I Can Make Dessert! New Sephora Feature - Reviews! Adorable! And a Good Cause to Boot! Bloggy Hint # 5 - How to Change "Posted By"
I'm Super Cool, So Follow Me!